The contents of this report reflect the views of the author, who is responsible for the facts and the accuracy of the data presented herein. The contents do not necessarily reflect the official policy of the Department of Transportation. The United States Government does not endorse products or manufacturers. Any trademarks or manufacturers' names that appear herein do so only because they are considered essential to the objective of this document. The FHWA Office of Safety Contract Task Order Manager was Karen Timpone. The Technical Oversight Working Group included: Thomas Ballard, Eugene Calvert, Tim Colling, Mark Hood, William Lozier, Jon Oshel, Joe Marek, and Tom McDonald. Highway signs are the means by which the road agency communicates the rules, warnings, guidance and other highway information that drivers need to navigate their roads and streets. 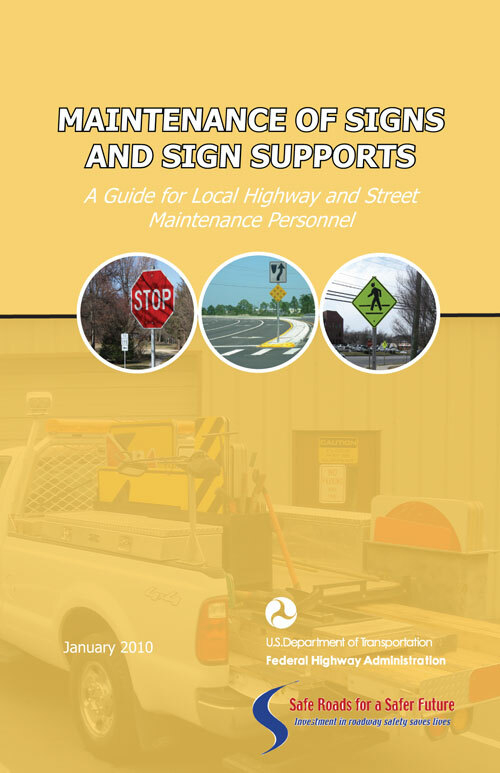 This guide, which is an update to the same titled guide published in 1990, is intended to help local agency maintenance workers ensure their agency's signs are maintained to meet the needs of the road user. The guide succinctly covers the following topics: a description of sign types, sign materials and sign supports; sign installation and the elements of a sign management system including inventory, inspection, preventive maintenance, repair and replacement, and recordkeeping. Signs, sign supports, maintenance, replacement, sign management. This guide was prepared by Vanasse Hangen Brustlin, Inc. (VHB) under FHWA Contract DTFH61-05-D-00024. Ms. Karen Timpone, Federal Highway Administration Office of Safety, was the Task Order Manager. The principal investigator and author was Dr. Hugh McGee, P.E. of VHB. Document preparation was performed by Ms. Michelle Scism of VHB. Thomas G. Ballard, P.E., TBA Consulting, Inc.
Eugene Calvert, P.E., PTOE, Collier County, FL. Tim Colling, P.E., Michigan Local Technical Assistance Program. Mark Hood, P.E., Pennoni Associates. William Lozier, P.E., Licking County, OH. Joe Marek, P.E., Clackamas County, OR. Tom McDonald, P.E., Iowa Local Technical Assistance Program. Their input and review were invaluable. Traffic signs are critical elements of the highway because they communicate the rules, warnings, guidance, and other highway agency information that drivers need to safely and efficiently navigate roads and streets. Well maintained signs are important as they help drivers make good decisions. This guide is intended to help local agency maintenance workers ensure their signs are maintained to meet this need. A. Materials and equipment used for sign maintenance. C. Typical work zone traffic control plans for sign maintenance activities. Even during maintenance operations, it is important for staff to question every sign that they work on to see if it is needed and meets standards applicable to its use. The decision to use a sign at a particular location should be made on the basis of either an engineering study or the application of engineering judgment. Local jurisdictions that do not have engineering staff knowledgeable of the MUTCD should seek assistance from their State transportation agency, another jurisdiction, or traffic engineering consultant. The Local Technical Assistance Program (LTAP) in each State and tribal area can be a valuable resource for this assistance as well. The rules of the road—the laws and regulations—are often communicated through regulatory signs. These are important signs to maintain because the absence of, or damage to, a regulatory sign could result in or contribute to a severe crash. Regulatory signs are usually a combination of black, white and red colors as shown by these examples. 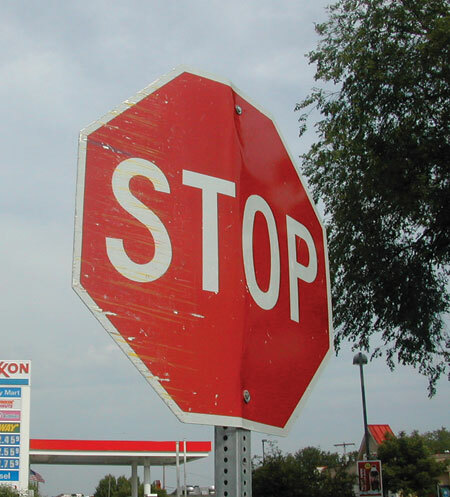 Damaged or missing regulatory signs (especially the STOP, YIELD, ONE WAY, and DO NOT ENTER signs) should be replaced or repaired within hours of the agency having notice of them missing, down, or damaged. Warning signs are important because they provide drivers with advance notice of potentially hazardous situations or conditions of the road ahead that may not be apparent. They are particularly helpful to motorists who are unfamiliar with a particular road. Warning signs, such as these, have a yellow background. Damaged or missing warning signs should be repaired or replaced as soon as possible. As a general rule, deficiencies should be corrected within three days of notice. Guide signs are used for driver navigation—to help a driver to get to a particular destination. There are a variety of guide signs that display route designations, destinations, directions, distances, services, points of interest, and other geographical, recreational, and cultural information. The absence of these signs could cause motorists to miss their route and destination, resulting in less than efficient navigation. It can also lead to erratic maneuvers, such as slowing or stopping in the roadway and making abrupt turns. For local roads and streets, common guide signs include: street name signs, route signs, and destination and distance signs. General service signs, e.g. the hospital symbol, and general information signs, e.g. the library symbol, are included within the guide sign group. Guide signs are usually white legend on a green background, but can be other backgrounds, such as brown or blue. Replacement of damaged or missing guide signs should be done within approximately seven working days from notice, recognizing that timing of the replacement is dependent upon how critical the sign is. For example, a street name sign is essential for emergency responders to find streets and locations on those streets. Also, since many guide signs have to be specially fabricated due to the variation in the sign message, it may take a few days before they can be assembled or purchased. Whenever there is construction, utility work, or maintenance being done on the road or roadside, temporary traffic control is necessary, which usually includes temporary warning signs. The warning signs used for this purpose have a black legend and border on orange background. While these are temporary signs, it is important that they be maintained because travel through work zones can be hazardous due to unusual or different conditions that drivers may not expect. These signs should not be allowed to deteriorate much below their original condition. For more information on this topic refer to the MUTCD, Part 6. Appendix C provides three typical traffic control applications from the MUTCD that would likely be used for sign maintenance activities. 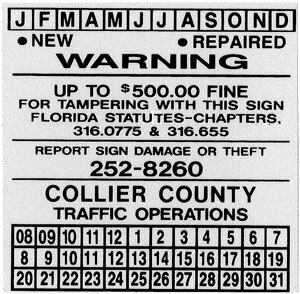 The response time frames for correction of missing or damaged signs mentioned above are provided to illustrate relative priority in providing sign maintenance activities. Each agency should adopt a policy that addresses sign repair response procedures and times both for normal work periods as well as after hour needs. A basic understanding of the materials that make up a sign is needed to carry out a good maintenance program. This section provides a brief overview of the materials for the sign face and the sign backing. The sign face consists of film material, called sheeting, which is comprised of glass beads or microprisms to provide visibility at night. Highway signs, that are not illuminated by external lights, are visible at night because they have sheeting made of retroreflective material. Retro-reflection is a type of reflection that redirects incident light from the sign face back to the source—the vehicle headlights. Retroreflection is achieved through either glass beads or microprisms imbedded in the sheeting. Type I — commonly referred to as engineering grade and typically made as an enclosed lens, glass beads sheeting. Type II — commonly referred to as super-engineering grade and also typically made of glass beads. Type III — commonly referred to as high intensity and can be made of encapsulated glass beads or microprisms. Types IV, VIII, IX and XI — no common identifiers but referred to as prismatic with the differences related to the varying angles of the microprisms. ASTM has established new sheeting specifications for minimum retroreflectivity values, called ‘coefficient of retroreflection’ (RA) for each sheeting type. RA is a quantitative measure and is expressed in metric units of candelas per lux per square meter (cd/lx/m2). The specification provides an initial RA value for a prescribed entrance angle and observation angle—common angles within an instrument that measures RA and relates somewhat to roadway/vehicle geometries. 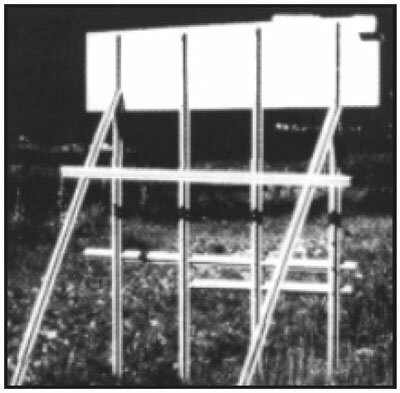 Minimum RAs for the various sheeting types of white, yellow, fluorescent yellow, green and red color sheeting used for permanent rigid signs at the common angle readings of -4 degree entrance angle and 0.2 degree observation angle—angles typically set for measuring RA in a portable instrument (see pg. 27) are shown in Table 1. The values shown in Table 1 are for newly purchased sign sheeting. Exposed to the sun and weather over time, the colors will fade and the retroreflective qualities of the sign sheeting will deteriorate to such an extent that the sign will no longer be readable, both day and night, at a distance needed by the driver. The 2009 MUTCD includes a requirement for minimum maintained retroreflectivity levels for most traffic signs. These values are shown in Table 2 for certain types of permanent signs most commonly found on local, non-freeway roads. Table 2. Minimum Maintained Retroreflectivity Levels for Specified Signs. * White to red contrast ratio shall be at least 3:1. Based on the values in Table 2, Type I sheeting material should not be used for warning signs and for the white legend on green background guide signs because it does not provide the retroreflectance level required by the driver. The higher level sheeting types will provide a brighter sign and in general have a longer service life, allowing for an overall cost savings. Agencies will have until January 2012 to establish and implement a sign assessment or management method in compliance with the 2009 MUTCD to maintain minimum levels of retroreflectivity. The compliance date for replacing signs that do not meet minimum requirements is January 2015, except for street name signs, which is January 2018. To learn more about sign materials and especially sign retroreflectivity, visit the following FHWA web site: www.fhwa.dot.gov/retro. The retroreflective sheeting material is applied to the rigid sign backing (also known as the substrate), which can be aluminum, wood, or a composite plastic. Aluminum is by far the most commonly used material. The aluminum backing can be reused often, reducing the cost of signing and can be recycled easily to recoup a small portion of the cost. Plywood is used occasionally for temporary signs because it can be cheaper and is lighter than aluminum. Fiberglass-reinforced plastic materials are used infrequently because of their handling and recycling issues. Most agencies use aluminum for sign backing. Square or round tube steel post. A sign support can become a deadly hazard when struck by a vehicle that drives onto the roadside; therefore, there is an MUTCD standard that requires all roadside sign supports in the clear zone (see Appendix B for description of clear zone) to be breakaway, yielding, or shielded by a barrier or crash cushion. 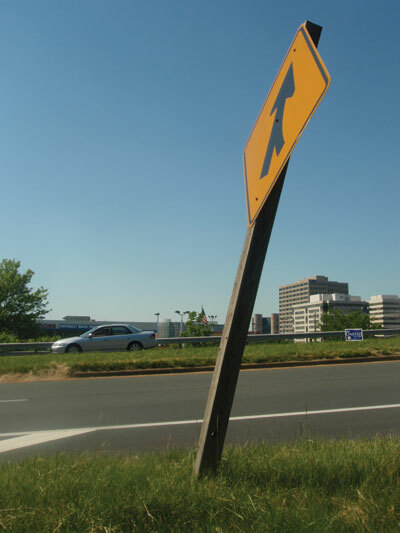 ‘Breakaway’ is a term to describe crash tested sign supports that break or bend upon impact. This includes sign supports that, when struck by a vehicle, separate from the base and are knocked ahead of or up and over the errant vehicle. A ‘yielding’ support refers to a support that bends, allowing a vehicle to run over it. Barriers are typically not installed to shield roadside signs, especially on local roads; hence, the design of the post, regardless of the type, must provide the breakaway or yielding feature. All sign supports on highways within the clear zone must either be of a breakaway type meeting the crashworthiness criteria of NCHRP 350 (see references) or be shielded by guardrail, barrier, or an energy absorbing system meeting NCHRP Report 350 or the AASHTO Manual for Assessing Hardware (MASH) criteria. Additional information on acceptable breakaway sign supports can be found at FHWA’s Office of Safety website: http://safety.fhwa.dot.gov/roadway_dept/policy_guide/road_hardware/breakaway/signsupports.cfm. Wood posts are frequently used, especially in regions where wood is economical compared to metal type supports. These posts usually come in sizes of 4 x 4 inches to 6 x 8 inches. All posts above 4 x 4 inch nominal size must be drilled perpendicular to traffic flow to allow the post to break away if struck by a motor vehicle. Small supports have a cross section of approximately 16 square inches. 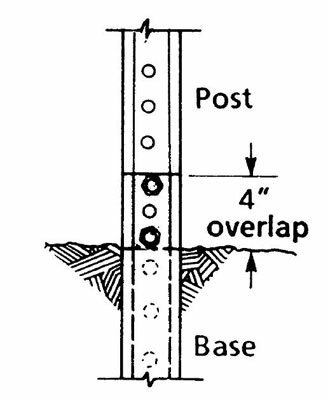 This type of post should be buried about 30 to 36 inches deep depending upon the type of soil and backfill; check State specifications or with LTAP for embedment depth and backfill material. The post may need to be buried even deeper to reduce vandalism and reduce dislodging by heavy winds. One or two posts may be used to make up the sign support, but adding posts too close together can affect crashworthiness. Small wood support is typically a 4 x 4 inch post. Large supports should be drilled to provide the breakaway characteristic. For example, a 6 x 8 inch wood post can be used if the cross section is weakened by drilling two 3-inch holes (drill perpendicular to roadway). A 4 x 4 inch wood post is the largest undrilled wood post recommended to act as a breakaway support. 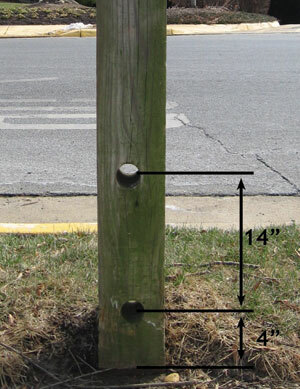 Holes are needed for wood posts greater than 4 x 4 inches. The U-channel, hot rolled steel post is another common small sign support. It is considered breakaway since it will bend, break or pull out of the ground when it is hit. Post Support. The post should be driven into the ground and not encased in concrete. 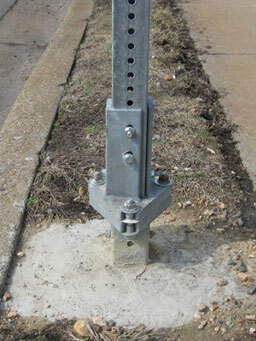 A broken or damaged post is easier to remove if it is not driven or set into the ground more than 3.5 feet. Breakaway Devices. A U-channel post of re-rolled rail steel weighing 3 pounds-per-foot or less meets breakaway requirements by itself. If a heavier post is used, splices can be purchased commercially to install at ground level; alternatively a stub post of the same material can be set in a concrete base with a 4-inch length available to bolt to the sign post as a base connection. These devices improve safety when the post is hit, will make repair easier, and will make it possible to use a U-channel post when it has to be placed in a concrete area. 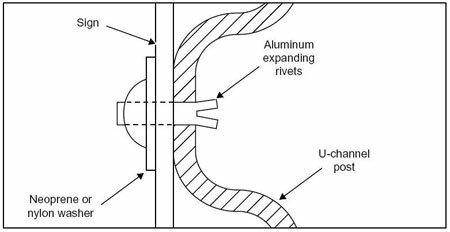 Breakaway treatments for u-channel posts. Another sign post is the square steel tube (perforated) design, which is used in many localities. Posts of this type are also considered breakaway if they are 2 ¼ inches or less in size. Post Support. Posts can be driven into the ground. Do not place concrete around the post. A broken or damaged post is easier to remove if it is not driven or set into the ground more than three feet. Breakaway Devices. As with the U-channel post, sleeve assemblies can be used for the base or slip couplings can be used near the base. These devices will increase the safety of a sign if it is hit and make it easier to repair. After the sign has been hit, the broken stub of the post can be removed from the base sleeve and a new sign post put back in place. Two types of breakaway designs. 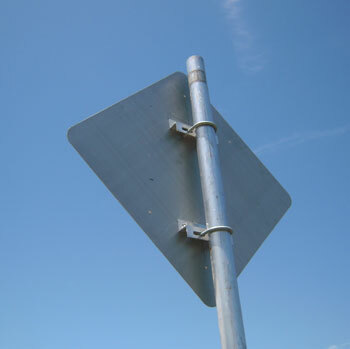 This post type is used when it is necessary to support large sign panels, which is common for roadside post-mounted guide signs. 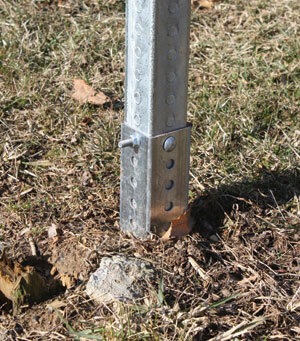 All large steel posts use a breakaway feature, unless protected by barrier or placed out of the clear zone. This is usually accomplished by using a slip base that connects the post to the foundation. 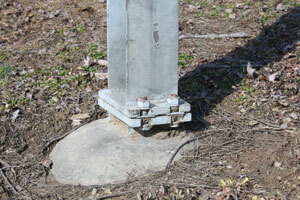 When struck, the post slips off the foundation at the bottom, and rotates around the hinge plate below the sign panel. This allows the vehicle to safely pass under the sign after impact. 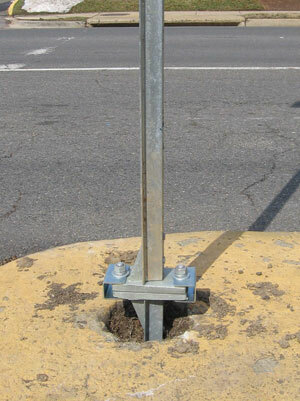 I-beam steel posts with a slip base are needed for larger roadside guide signs. There are many other products available commercially for sign supports. Use depends on local requirements and costs. 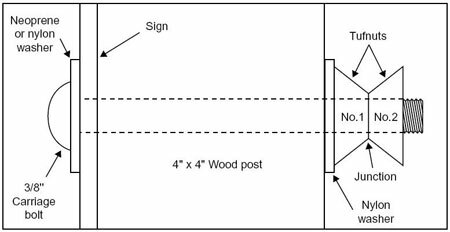 This publication only shows four of the most common types of small sign supports. 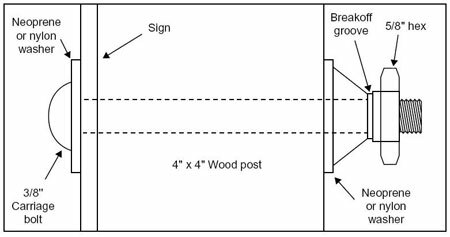 The comprehensive guide to breakaway sign supports is A Guide to Small Sign Support Hardware. When installing a sign for the first time or as a replacement to an existing sign, the sign technician should be aware of the requirements for its position on the roadside. Signs are positioned longitudinally along the road, laterally from the edge of the road, and vertically above the ground. If a sign replacement is warranted, the sign technician should not assume the original sign was placed correctly. It is important to check the location of the support and the mounting height of the sign above the roadway to ensure the sign is visible and crashworthy. The longitudinal location of the sign is dictated by the sign type and the specific situation. There are too many different situations to cover in this guide, so refer to the current edition of the MUTCD, your State standards and/or directives, and your agency’s requirements. The figures on the next page represent the recommended height and lateral location as provided in the MUTCD. WHEN INSTALLING A NEW SIGN CHECK WITH YOUR UTILITY COMPANY AND ANY OTHERS WHO MAY HAVE UNDERGROUND CABLES AND CONDUITS. To obtain maximum retroreflection from traffic signs, yet eliminate specular glare, signs should be correctly aligned. Specular glare is the mirror type reflection characteristic of any glossy surface. Under severe circumstances, such as direct sunlight, specular glare can make the sign legend unreadable. Often this becomes apparent from driver complaints. To avoid the occurrence of specular glare, signs should be positioned slightly more than perpendicular to the roadway (93 degrees is recommended by sheeting manufacturers). When signs are out of proper alignment, they will not be as visible at night. Inventory — a manual or computer-based database of signs installed on your roads. Inspection — a program for scheduled inspection of signs. Preventive Maintenance — activities that will ensure that signs will attain their full service life. Repair and Replacement — a program and process for either repairing or replacing non-functional signs. Reporting and Record Keeping — a process for keeping record of all maintenance activities. When these elements are in place and followed, the agency can be assured that the signs on their roads are functional and meet the needs of the road users. Each of these elements will be discussed separately in the following chapters. 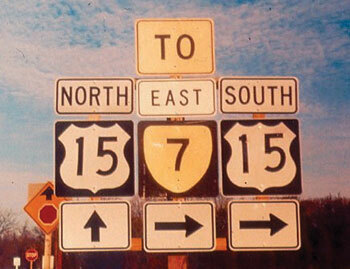 Sign Life — when signs are installed, the installation date is labeled or recorded so that the age of a sign is known. Signs degrade over time and when combined with periodic night time inspections, an agency could determine when a sign has reached the end of its useful life. Where a single sign needs to be replaced. If a corridor needs sign improvements. When to clear back brush away from signs. Minimizing tort liability — an inventory can document the inspection and maintenance activities. Budgeting — an inventory can help manage resources for sign replacements on an annual or as-needed basis. Efficiency — combining work orders with the inventory allows the monitoring of signing activities and scheduling of maintenance activities. Inventory systems can be simple manual card systems, but with the availability of several inexpensive and even free computer software packages, computer-based inventories are much more effective and are easy to use. Also by using global positioning systems (GPS) technology, signs can be easily and accurately located and mapped on geographic information systems (GIS). Computerized sign inventories are available through sign vendors or your Local Technical Assistance Program. An example of sign inventory can be found at the Utah LTAP website: http://www.utahltap.org/. 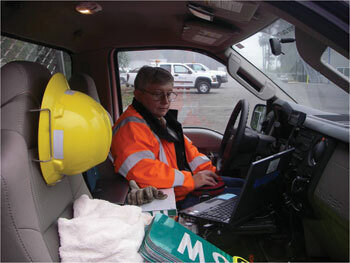 With a computerized sign inventory, the sign technician can easily record data while in the field. The key to a successful inventory program is collecting the appropriate data elements and keeping it up to date. Table 3 shows the data elements that should be considered when developing an inventory. Table 3. Data Elements for Sign Inventory. Sign dating labels with anti-vandalism warnings can be applied to the back of the sign. Timely detection of and response to maintenance needs are critical elements of an effective sign management system. This can be accomplished through periodic inspections of your signs to ensure they are still there, are needed, and are performing as intended both day and night. Agency's employees — train all staff to look out for any signing deficiencies and report their finding. Police patrols — establish a procedure whereby the police department notifies you of any sign problems. Citizen inputs — do not overlook the importance of having citizens contact your agency when they observe problems; having a phone number on the sign dating sticker on the sign is recommended for this purpose. When your agency receives notice of any sign deficiency from any of the above methods, it should be recorded and attended to within the appropriate priority for the type of sign involved. Training of sign technicians — train all maintenance staff on what to look for and how to detect the various sign deficiencies. Inspection schedule — inspect signs and supports routinely. All agencies should establish a policy for when inspections would occur, taking into consideration the level of importance for the signs, road type or traffic volumes. Inspection procedures — the details of how an inspection is to be performed should be prescribed by the agency and used for training of its staff. On-the-spot repair/replacement — many deficiencies may be resolved immediately; this requires that the maintenance technician has the necessary equipment, replacement parts, and signs on hand. Preparation of work orders to correct problems — a system of work orders should be used for more time consuming repairs. Recordkeeping — having a record of the inspection and repairs is critical to a successful sign management system and will be a valuable asset for your risk management program and tort defense. A traffic sign can be found deficient for a variety of reasons (see Sign Inspection Checklist, on pg 28), including the degradation of night time visibility. There is now a standard in the MUTCD that requires that all agencies have a maintenance program in place by 2012 to maintain minimum levels of traffic sign retroreflectivity. Regulatory, warning and many guide signs will need to be replaced when they degrade below the established minimum levels of retroreflectivity presented in Chapter III. Your agency can meet these requirements by having an inspection program that will identify when signs need to be replaced. Measuring the sign’s retroreflectivity level with a retroreflectometer. Visually comparing the sign with a test panel that has a retroreflectivity level set at the minimum requirement. Visually inspecting the sign and making a subjective judgment by a trained inspector as to its adequacy. The first method is the most accurate, but it is time consuming and many agencies cannot afford the needed retroreflectometer, which costs about $10,000. However, you may consider borrowing one from your State DOT or LTAP. The second and third methods can be effective if the inspector is adequately trained. The inspection should be done at night. More details on these procedures can be found in Methods for Maintaining Traffic Sign Retroreflectivity, and the reader may want to contact their State LTAP/TTAP center for alternative inspection methods. 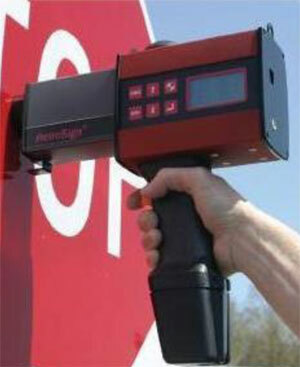 A retroreflectometer can be used to determine if a sign meets or exceeds the minimum required retroreflectivity level. Remember, night reviews are still important. While a sign may appear adequate during the day, it may be non-visible at night. 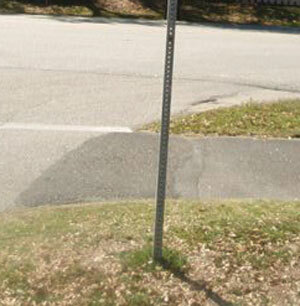 Is the sign the correct one; is it in accordance with MUTCD? Is the sign visible, both day and night, at the required distance? (Indicate cause of problem if not [e.g. blocked by vegetation, other signs, etc.]). Is sign support break-away or yielding? If not, are sign supports located outside the clear zone? Signs along routes with heavy truck traffic. Also, before deciding to replace a sign because of observed low night time visibility, the sign life might be extended simply with cleaning. Signs under a tree canopy are often covered with mold (left photo) which can easily be cleaned (right photo, right half of sign). When cleaning a sign a non-abrasive cleaner free of damaging solvents should be applied with a sponge or soft bristle brush. Pressure sprayers may be used if not sprayed so close to the sign that it would damage the sheeting face. Whatever procedure is followed, it is best to first check with the product supplier and test out any chemical cleaner on a sign in the maintenance yard before use in the field. 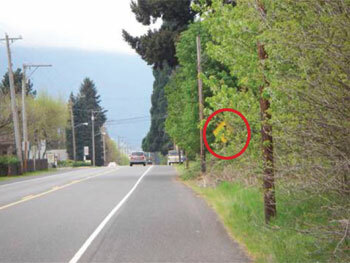 One of the common deficiencies found during an inspection is partial or full blockage of the sign by roadside vegetation. During the spring and summer seasons, fast growing weeds can quickly cover a sign as will tree branches and brush. If sign inspections are done during these seasons, these situations should be readily identified. And, if the technician has suitable equipment, it can be rectified during the inspection. The topic of vegetation control is more thoroughly discussed in the FHWA field guide entitled, Vegetation Control for Safety, A Guide for Local Highway and Street Maintenance Personnel. The warning sign (circled) is only partially visible in the spring. By mid-summer, it will be completely hidden by vegetation. Expanding anchor bolts and blind aluminum rivets. 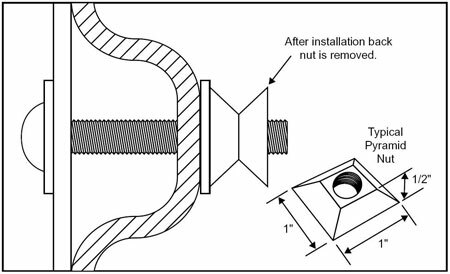 Bolts (or nuts) that require special tools to install and remove them (such as fluted nuts or star bolts). Simply hammering down the excess portion of the threaded bolt so that it cannot be easily unscrewed. 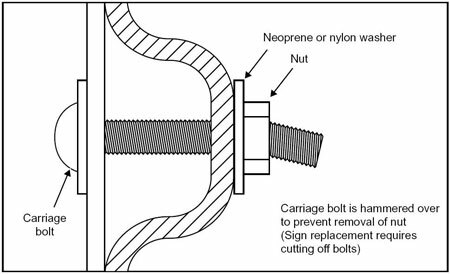 Simple details of anti-theft /anti-vandal fasteners. Expanding anchor and blind aluminum rivets. Fluted nuts (double pyramid shape). Ensuring the sign post is still firmly placed in the ground. 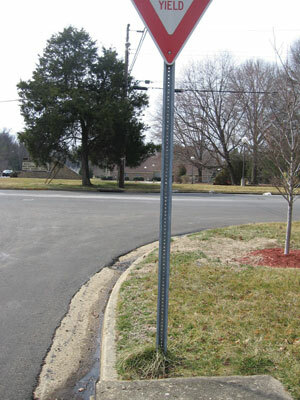 During formal or informal inspections of signs, a sign leaning away from the vertical will likely indicate that the sign post is no longer stabilized in the ground or not properly attached to the slip base. Visibility of sign will diminish if not vertically straight. Maintaining the sign crashworthiness by not adding additional unnecessary supports and braces. The sign, pictured to the right, has multiple posts supporting it when two are probably enough. Also, two horizontal braces cross the bottom. These increase the strength of the support greatly, but a small car hitting this is likely to stop suddenly, causing severe damage. Larger posts with breakaway mechanisms at the ground would be the safe construction. Too many posts and braces can be a safety hazard. Positioning the sign so that it is not frequently hit or adding a marker to increase its visibility. Signs placed at the near end of a median island are frequently knocked down because of the tight radius for large vehicles to stay within the designated lane. Preventive measures include moving the sign back a few feet from the end and placing an object marker on the post, which increases the visibility of the sign structure. 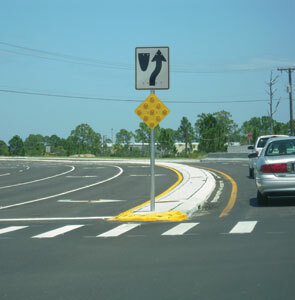 Knockdowns of signs in the median may be avoided with use of an object marker. The environment can also be a factor on the safety characteristics of sign supports. The two most common conditions that can affect the crashworthiness of a sign support are erosion of soil at the base and the growth of trees around the support. Relocated and/or adjusted by private individuals. Damage by weather or other natural factors. When a traffic sign requires repeated maintenance, consideration should be given to the reason why the problem exists. Although sign vandalism in some cases seems to be an overwhelming problem, it is a situation that cannot be ignored. Examples of sign vandalism include sign stealing, over painting, and bullet holes. Also, signs are often severely bent or knocked down by vehicles running off the road and hitting the sign, which is why crashworthy sign supports should be used. 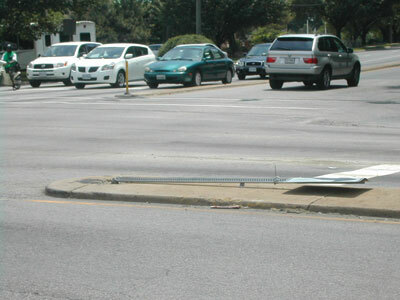 Signs can be bent, twisted, knocked down or even blown away by strong winds. Finally, signs will eventually become ineffective, when they have reached their service life, because the colors have faded and/or the retroreflectivity level is below the minimum required for that type of sign. When signs are damaged by vandalism, by a vehicle hit, or by weather factors, the sign technician must determine if the sign should be repaired, replaced, or left as is. This is usually a field judgment. More often than not, it is cheaper to replace a badly damaged or unreadable sign than attempt many repairs in the field. When determining whether or not to conduct repairs in the field, the technician should consider the repair costs, remaining service life of the sign face after repairs and the value of the sign blank (when it is reusable) against replacing it with a new or recycled sign. A sign technician should not leave a sign down or take a damaged sign away and leave nothing in its place. The technician should always have a replacement sign or sufficient repair materials while working in the field. If a field repair is appropriate or repair of the sign is needed until a replacement sign can be obtained, consider the following tips while performing the work. Signs may be bent such as this STOP sign pictured at right. While many bent signs can be read in the daylight, some bent signs, even signs with minor bending, are difficult to see at night because they no longer reflect the light from the vehicle’s headlights back to the driver’s eyes. 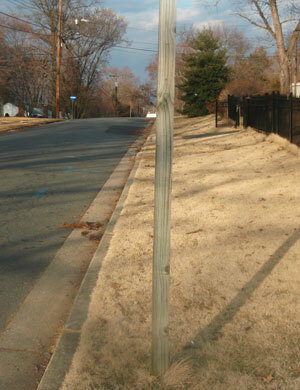 Minor bending like this may be repaired by removing the sign from the post and straightening the sign face. Bent signs can be repaired in the field. First try to straighten the sign. If possible, bend the sign back in place on the sign post with hand pressure (wear leather gloves). If the sign is no longer serviceable, replace it immediately if it is a regulatory or warning sign. If a replacement sign is not immediately available, remount the existing sign until you return later with a satisfactory replacement. Signs with scraped faces (usually as a result of being hit) or signs that have holes in them (typically as a result of gunshot vandalism) are often no longer legible, particularly at night. The damaged areas no longer reflect light back to the driver. This sign has been hit by several gunshots. 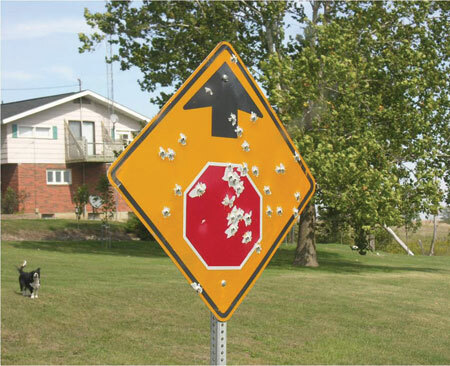 Even with the holes the sign can be read during the day and functions as intended, but leaving a sign up in this condition does not convey a serious message and may encourage more gun shots to this and other signs. The sign should be replaced or repaired as soon as practical. Minor damage can often be repaired in the field. Signs with extensive gunshot holes should be replaced. The sign should first be straightened and any bullet holes pounded flat using cardboard or cloth to protect the sign face and pound it flat with a rubber mallet. Clean the area(s) to be patched with Xylol, then Varnish Naphtha. If you carry replacement sign faces or patching materials, make sure that the retroreflective material being used for patching is the same as the material on the face of the sign. If in doubt about what type of sheeting to use replace the sign. Follow the manufacturer’s recommendations when making field patches. Cut background field patches slightly larger than the damaged area. Pressure sensitive material should be extended at least 1/2-inch beyond the damaged area. Replace the damaged legend with diecut, pressure sensitive, pre-spaced letters, borders and symbols and firmly squeegee into place. Seal the hole on the back of the sign by applying aluminum foil tape to stop moisture from reaching the adhesive on the sign sheeting patch. For large holes, start placing the foil at the bottom of the hole, overlapping about 1/2-inch in a shingle fashion as you move up covering the hole. If the sign is subject to snow burial and the replacement sheeting extends to the top edge of the sign, place transparent film along the top edge to seal out any moisture. Of course, if signs can be relocated to an area to avoid snow burial, they should be. 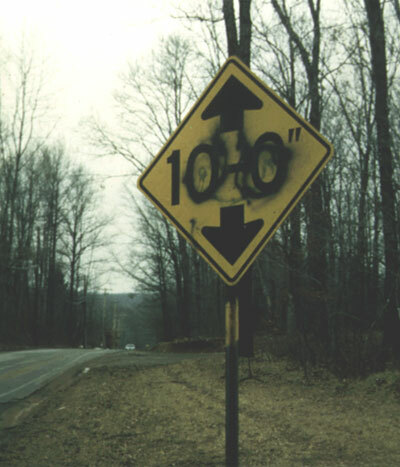 This sign shown to the left has been sprayed with black paint. Everyone who looks at the sign notices it. At night the message becomes hard to read. The safety effectiveness of this sign is significantly reduced and requires immediate attention. Overpainted signs can often be cleaned, however, many cleaning materials will damage the sign face materials which will result in the need to replace the sign. There are several approaches to overpainted signs. All these approaches work to varying degrees to help reduce and control this problem. Generally a combination of these approaches is recommended for communities with recurring or increasing vandalism problems. 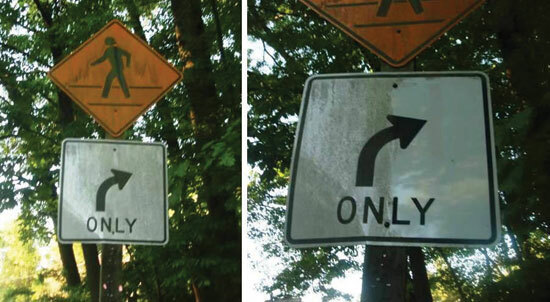 Paint can sometimes be removed from the face of signs without damaging or reducing the sign’s retroreflective properties. Several manufacturers have developed sign protective overlays that are more tolerant to paints and cleaning agents, and they have also developed improved cleaners. Paint should not be removed with abrasive compounds or implements that will leave the sign face scratched (e.g., steel wool). After cleaning off paint, signs should be inspected under night conditions or measured to determine if they have retained sufficient retroreflective characteristics to remain legible at night. Over time the colors of the sign facing will fade—especially for signs facing south towards the sun—reducing the contrast level between the legend and the background, andthe sheeting’s retroreflectivity properties will diminish, such that the sign can no longer be seen and read by the driver from an adequate distance. Under either condition the sign has reached its service life and should be replaced. As mentioned in Chapter III, there is a new standard in the MUTCD for maintaining sign retroreflectivity and contrast levels. By January 2015, agencies are required to replace regulatory, warning and ground-mounted guide signs (except street name signs) that fall below the minimum requirements. By January 2018, the replacement requirement extends to street name signs and overhead guide signs. As noted earlier the agency’s inspection program should be able to identify signs that need to be replaced for this reason. Also mentioned earlier is the possibility of cleaning the sign to extend its useful life. 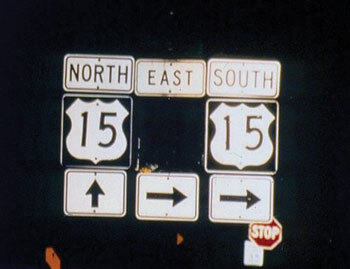 Based on expected sign life — the sign is replaced when it has reached its expected life, which is based on the experience of retroreflectivity degradation in the geographic area. Blanket replacement — all signs in an area or route, or of a given sign type are replaced at specified time intervals. Control signs — replacement of signs in the field is based on the performance of a sample set of signs placed and monitored in the maintenance yard. In this day and age the job is not over until the paperwork is complete. The importance of keeping good, up-to-date records of maintenance activities cannot be overstated. Aside from making the agency’s management program more effective and efficient, record keeping is necessary as a risk management strategy—keeping records of inspections and maintenance activities will help in avoiding liability claims of insufficient signing allegedly contributing to vehicle crashes. Defend against lawsuits arising from collision with or challenges about the condition of the sign. The sign/sign support maintenance records. What action was taken, when it was taken and who was responsible for it. If there was a subsequent review of the work then note who made the review, when it was made and any subsequent actions required and taken. Time and date of work and name of person responsible for completed work. Sign/support location by street or highway and traffic direction it is facing. Type of sign and size of sign if replaced. Type and size of support if replaced. If the following were/are to be checked what were they? Height to bottom of sign. Any breakaway features of post. Orientation of sign (for night traffic). Wear or fading of sign. Location with respect to pavement. Anything blocking driver's view of sign. The maintenance activities records should then be used to reflect the changes made to the signs and/or sign supports by adjusting and updating the sign inventory. Manual of Uniform Traffic Control Devices for Streets and Highways. Federal Highway Administration, 2009 Edition. Provides the standards and guidance for the size, shape, color, message, appropriate use and location for signs. The current manual is available on the Internet through the web site addressed: http://mutcd.fhwa.dot.gov. Standard Highway Signs Handbook. Provides detailed drawings of signs provided in the MUTCD. Can be accessed at: http://mutcd.fhwa.dot.gov/ser-shs_millennium_eng.htm. Ross, et al. "Recommended Procedures for the Safety Performance Evaluation of Highway Features," NCHRP Report 350, Transportation Research Board, 1993. Traffic Signing Handbook. Institute of Transportation Engineers, 1997. Roadside Design Guide, 3rd Edition with updated Chapter 6. American Association of State Highway and Transportation Officials, January 1996. 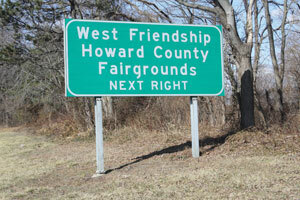 FHWA web site for Retroreflectivity and Crashworthy Sign Supports: http://safety.fhwa.dot.gov/. Vegetation Control for Safety, A Guide for Local Highway and Street Maintenance Personnel. Available at http://safety.fhwa.dot.gov/local_rural/training/fhwasa07018/. Six (6) wood posts 4" X 4" X 12'. Four (4) wood posts 4" X 6" X 14' - pre-drilled. Four (4) wood posts 4" X 6" X 16' - pre-drilled. Four (4) U-channel posts 8' long. Four (4) U-channel posts 10' long. Four (4) square steel tube posts 2.25" X 2.25" X 10' long. Others as unique to your area. Oversized neoprene or nylon washers. Several boxes of bolts with nuts. Facemask to protect lungs from spray paint and dust. One package of assorted capital letters. One package of assorted arrows and numbers. Two rolls of transparent film (one 2-inch width, one 3-inch width). Four one-quart cans of clean sealer or equal. Four one-quart cans of thinner or equal. One-pint can of activator or equal. One rolls each of reflective tape in red, yellow, green, orange, blue and white (background). One container of naphtha, and a large can of wood filler. Two rolls of aluminum foil tape for backing sign holes. Two rolls of masking tape. Several different size adjustable wrenches and a pair of adjustable (horse-faced) pliers. Weed cutter for clearing vegetation-blocking signs. 3-cu. ft. utility wheelbarrow as there may be a need to mix concrete for sign bases, move hole spoil, or bring in material to fill holes. Brace and bits to drill holes in wood posts. Set of woodworking chisels for trimming wood posts. Hacksaw to cut bolts and rivets. Crosscut saw for cutting wood posts. Posthole auger, posthole digger, and posthole breaker bar for preparing new postholes and resetting posts. Double-handed slip hammer of suitable size for driving posts, usually U-channel and square tube. 16-lb. or 20-1b. double-faced sledgehammer. 16-oz. or 20-oz. curved claw hammer. Heavy-duty tall stepladder or an extension ladder. 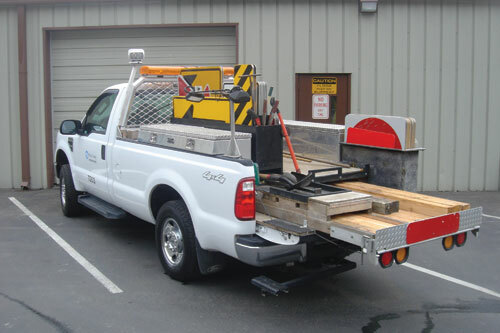 Example of Truck for Sign Maintenance. The concept of clear zone is an approach to minimize the number and severity of crashes involving vehicles running off the road. Simply stated, it is a traversable area that starts at the edge of the traffic lane and extends laterally a sufficient distance to allow a driver to stop or return to the road before encountering a hazard or overturning. The traversable area would be considered safe, if there were no fixed objects, unless they are breakaway, and if the roadside geometry (either the fore slope, back slope, or ditch) was flat enough that a vehicle could safely traverse the area without tipping and rolling over. Roadside safety features include breakaway sign and light posts, and traversable drainage structures. Curbs are not considered a roadside safety feature since they can be easily mounted by errant vehicles; hence, their presence does not alter how clear zone is measured. A safe traversable slope can be either a recoverable slope or a non-recoverable slope with a clear run-out area at the bottom. 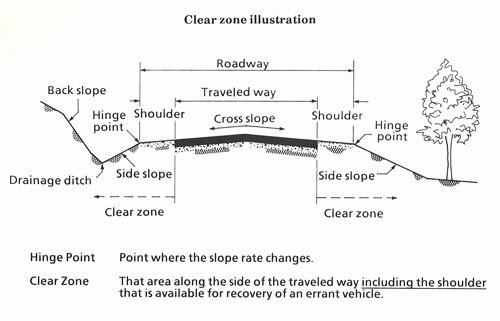 A recoverable slope is a slope on which a motorist may, to a greater or lesser extent, retain or regain control of a vehicle and recover or stop. Slopes 1:4 (Vertical:Horizontal) or flatter are generally considered recoverable. A non-recoverable, traversable slopeis a slope which is considered traversable but on which an errant vehicle will continue to the bottom. Embankment slopes from 1:3 and 1:4 may be considered traversable but non-recoverable if they are smooth and free of fixed objects. A clear run-out area is the flatter area at the toe of a non-recoverable slope available for safe use by an errant vehicle. Slopes steeper than 1:3 are not considered traversable and should not be found in the clear zone. The objective of roadside safety is to provide and maintain as much clear zone as practical. The design clear zone is the minimum width to be provided on a project and is dependent upon speeds, the roadside geometry, and traffic volumes. Further details on clear zone can be found in the Roadside Design Guide.